In a week I'll be off to New Orleans for the American Library Association conference. I've never been to Louisiana, let alone New Orleans, so I'm pretty excited...though I'm fairly nervous about the June weather there. Have you seen my curly hair?! But I've got scarves ready to go, and I'm taking a bunch of up-do ideas with me, courtesy of Joanna Goddard of A Cup of Jo. I also have some dinners planned that are work-related, committee entertaining and the like. I made reservations for Galatoire's and The Palace Cafe, though I actually won't be attending the dinners. I will, however, be able to attend a dinner at Bayona, and I can't wait! We're going to try to hit up Cafe du Monde, of course: BEIGNETS! The timing is perfect then for Alice Q. Foodie to be posting about New Orleans! Check out her posts here and here. 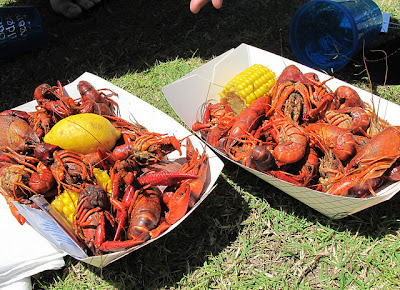 Her photos are getting me so excited for the trip - check out the photos from the crawfish festival!!! I do have one night free and I'll be going out with some colleagues. When we do get a chance to be free from authors and guests, we tend to try to get to local places, if we can, and something very relaxed (since these are usually the only opportunities we have to get out of our business attire). Those of you who have been to New Orleans, do you have any suggestions for something relatively close to the convention center that's relaxed with a local flair? I know we'll be right in the French Quarter and, thus, probably in tourist hell...but there's got to be something, right? Let me know! Mothers is the place to go! I am trying to figure out what food I have to eat, what restaurants I have to try. So many choices! Hi Laura: I checked with my friend who lives there and here's what she had to say, "3 muses on frenchman is fun. also marigny brasserie, and iris in the bienville house hotel, for more upscale. any of the brennan's restaurants. mother's on poydras. frankie and johnny's uptown is unassuming and good. see if you can get to... willie mae's scotch house or dooky chase for fried chicken and all the fixin's. (lunch only). liuzza's by the track is amazing. napoleon house for a pimm's cup and cheese plate. cafe degas for brunch--never disappoints. parkway bakery for poor boys-hey, Obama ate there." and one more opinion on where to go! "Elizabeth's, Cake Cafe. Koops. Cafe Degas. Lola's. Parkway Bakery. Jacquesimo's. Green Goddess. Mandina's. Liuzza's. Ruby Slipper. Rio Mar. One. Iris. Olivier's. Cochon. Butcher. Crescent City Steakhouse . Jack Dempsey's. Commander Palace. Bayona. NOLA. Stanley. to name a few..."